On June 30, a handful of demonstrators gathered outside Westminster touting an eight-foot carbon fibre dummy of media tycoon Rupert Murdoch as a puppet master. From his hands dangled the marionettes of British Prime Minister David Cameron and MP Jeremy Hunt. The protest was about Rupert Murdoch’s potential takeover of media organization BSkyB, which Hunt, in charge of culture, sport and media, was expected to approve. 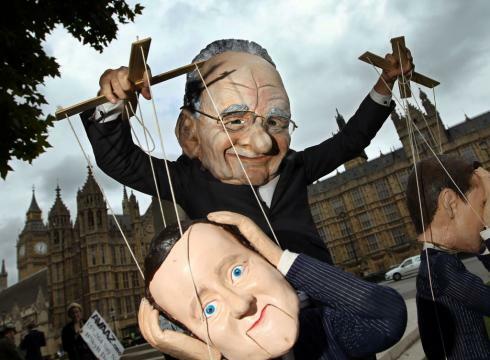 On July 6 the puppet master appeared again, and photos of it spread while the media chronicled the phone-hacking scandal that led Murdoch to close News of the World, his empire’s crown jewel. It’s an image that sticks: the shadowy, larger-than-life character pulling the strings of British policy. In a theatre, he would be hiding behind heavy velvet curtains. It took a phone-hacking scandal to pull the drapes apart. But before that even happened, requesters under the Freedom of Information Act were already tugging at the fringes, looking to bring decision-making back into the public realm. According to the FOI tracker whatdotheyknow.com, at least three requesters asked about Murdoch and his meetings with government ministers. One request was refused, two were partially successful – no information about the content of the meetings was disclosed – and the last one, sent only recently, is awaiting response. Carl Bernstein, the famed journalist who, with Bob Woodward, discovered the Watergate scandal, wrote an article in Newsweek suggesting some similarities to Nixon’s wiretapping. Almost every prime minister since the Harold Wilson era of the 1960s and ’70s has paid obeisance to Murdoch and his unmatched power. When Murdoch threw his annual London summer party for the United Kingdom’s political, journalistic, and social elite at the Orangery in Kensington Gardens on June 16, Prime Minister Cameron and his wife, Sam, were there, as were Labour leader Ed Miliband and assorted other cabinet ministers. In fact, newspapers have documented meetings between Murdoch and former Prime Ministers Tony Blair and Gordon Brown, though not much information was obtained on their content. Details of Blair’s contacts with Murdoch in the nine days before the start of the Iraq War were released in June 2007, four years after Liberal Democrat peer Lord Avebury sent the initial FOI request. They were released as soon as Prime Minister Gordon Brown took over. But because the content of most of the discussions were not revealed, the media was left to attach official events to phone calls in hopes of getting an idea of what was said. In the few days leading up to the start of the Iraq War, Tony Blair had three phone conversations with Rupert Murdoch. One of these was ‘official’ and minuted by civil servants. The other two must have been either ‘personal’ or ‘party political’ or not significant enough to be minuted, if the Cabinet Office is to be believed. What they talked about at this time of extreme international tension we do not know. Avebury was in the process of appealing this to the Information Tribunal, when his legal team were staggered to be told by government solicitors that the Cabinet Office would give in and disclose the information. Funnily enough, this capitulation was communicated to them on the day after Gordon Brown became prime minister. So did revealing the dates when Blair talked to Murdoch figure prominently on day 1 of his grid for his first 100 days as PM? Brown was targeted in the News of the World phone-hacking scandal – as was everyone who is anyone, it seems – but back when all of this was still secret, he was equally reluctant to share details of his own meetings with the media mogul. The Independent, which issued an FOI request asking for “details of any meetings” between the two was told by a Downing Street official there were no minutes to show. The Prime Minister has promised to respect “the public right to know” and bring in “new rights to access public information where previously it has been withheld.” Last October, he scrapped plans by Tony Blair to make Freedom of Information requests more expensive to deter more frivolous requests. Mr Brown released details of Mr Blair’s contacts with Mr Murdoch only days after becoming Prime Minister last June. But he is remaining coy about his own discussions with him. Liberal Democrat MP Nick Clegg called Brown a hypocrite and that was that. In May 2010, The Mirror reported that “the media baron sneaked in by a back door for a private meeting with Prime Minister” David Cameron, and heavily influenced the current government media policy. Mr Murdoch stands accused of writing the Conservatives’ media policy. The Tories have already agreed to two of his key demands – abolishing the media regulator Ofcom and axing the BBC Trust. All four of Mr Murdoch’s UK newspapers backed Mr Cameron in the general election. When Mr Cameron was the Opposition leader, he accepted £34,000 of free private jet flights to talk with the tycoon on his yacht off Greece. The Mirror also hit a brick wall when asking what the meetings were about. This week, both Brown and Cameron publicly condemned the phone-hacking, after it was revealed that The Sun obtained confidential information in 2006 that Brown’s son had cystic fibrosis. Cameron took a step further in opposing the BSkyB bid, striking another blow at Murdoch’s News Corp, which has already lost $7 billion, or £4.4 billion in market value in the past four days. Bernstein doesn’t think Murdoch will ever end up in jail, even though feigning ignorance of his staff’s illegal practices has not proven to be a very convincing defence. Could Murdoch eventually be criminally charged? He has always surrounded himself with trusted subordinates and family members, so perhaps it is unlikely. Though Murdoch has strenuously denied any knowledge at all of the hacking and bribery, it’s hard to believe that his top deputies at the paper didn’t think they had a green light from him to use such untraditional reportorial methods. This entry was posted in Freedom of information and tagged Freedom of information, phone-hacking, transparency. Bookmark the permalink.